ROBERT CRUWYS was the eldest son of Sir Alexander Cruwys, lord of the manor of Cruwys Morchard. This is a tiny village between Tiverton and Witheridge, consisting of little besides the church and manor house. Robert was probably born about the middle of the 13th century, during the long reign of Henry III. MATILDA FITZPAYNE was the daughter of Robert and Nesta Fitzpayne of Witheridge, which lies 12 miles west of Tiverton and 6 miles from Cruwys Morchard. It was the administrative centre of the district known as the Witheridge Hundred. Her father was lord of the manor of Witheridge. The Fitzpaines were also lords of the manor of Cheriton Fitzpaine, in the 13th century. Cheriton Fitzpaine is four miles southe of Cruwys Morchard and six miles from Witheridge. It may be that her father held both manors. If not, then she would certainly be related to that family. 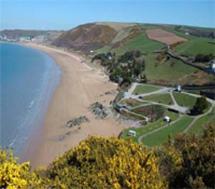 From her mother, Matilda inherited the estate of Over Wollecomb in Mortehoe. Woolacombe stands at the northern end of Wollacombe Sand, a fine beach on the north-west tip of Devon, looking out over Morte Bay. Overwoolacombe Barton lies a little way upstream, in a fold of the valley. Robert and Matilda were probably married in or before the 1270s, since their eldest grandson was born about 1299. The couple had at least two sons,, named Alexander after Robert’s father,and John. In 1280, Sir Alexander died and Robert succeeded to the manor of Cruwys Morchard. It is recorded that in 1295 he held this manor by one knight’s fee as of the Honour, or barony, of Bradninch. This barony had been created in the previous century for Reginald, natural son of Henry I. By 1285, Over Wollecomb had also passed to him, through Matilda. He held it of Geoffrey de Kamvil, to whom he may have had to render military service. It was probably under Robert’s lordship that the first stone church was built in Cruwys Morchard, replacing an earlier wooden one. This church, next to Cruwys Morchard House, has been dated to the early years of the 14th century. Two subsequent fires have left only the chancel, the lower stages of the tower, with their windows of the decorated period, and the lower part of the nave walls. Sir William Pole lists ‘Robert Crewes, of Morchard Crewes, Kt’ among those ‘of best worth wthin this countye, having either dwellings of lands’ in the time of King Edward I (1272-1307) and again under King Edward II (1307-1327). Robert died in 1310, in the reign of Edward II.